Manchester United’s Dutch striker Robin van Persie has played down concerns over his fitness ahead of the start of the World Cup. The striker assisted Bayern Munich midfielder Arjen Robben in the 32nd minute of yesterday’s 2-0 friendly win over Wales, but was subbed off at halftime. The former Arsenal man insisted that the early substitution was merely a precaution, which should give Oranje fans a boost ahead of their country’s opening match against defending champions Spain next Friday. 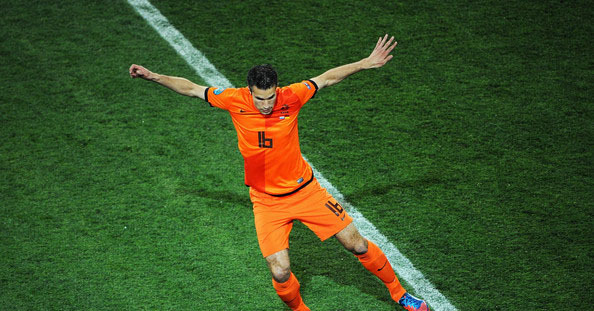 van Persie is one of the most integral pieces of the Holland squad once again, and as captain of the national side his manager Louis van Gaal will be hoping for some inspirational displays this summer. van Gaal will be seeing a lot of van Persie over the coming year as the two will reunite at Carrington for preseason training for Manchester United this summer following the tournament. After squaring off against Spain, the Dutch will be expected to beat both Chile and Australia in their remaining Group B matches, which should see them through to the Round of 16 in this summer’s showcase in Brazil. This World Cup is van Persie’s third after the striker featured in 2006 and 2010, scoring two goals in football’s most prestigious tournament.